The police arrested the owner of Besan Café, site of a shooting that left a man and woman wounded two weeks ago, early Saturday morning, according to police director Jerry Speziale. Fadi M. Abuawad, 35, of Paterson, is accused of selling illegal hookah and possession of weapons, police said. His business was raided at around 1:25 a.m. after the city received complaints about the establishment from the community. 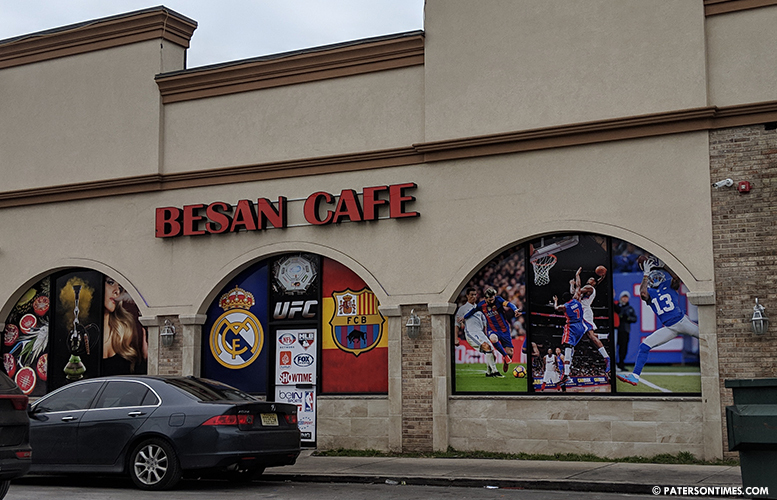 Upon entering the Besan Café at 210 East Railway Avenue, police and other city inspectors observed various ignited hookah pipes inside the establishment. Police seized 69 hookahs and various accessories from the location. Police searched the business and discovered a BB gun, Pietro Beretta Model 84 FS Caliber 6mm, and a 16-inch machete. Abuawad was charged with two counts of possession of a weapon and issued two ordinance violations for sale of hookah and smoking indoors, police said. $1,657 was confiscated from him and the business. Abuawad had $1,154 in cash on his person and $503 in a cash register. Police seized the cash as proceeds from sale of illegal hookah. The raid was conducted by police and fire. Fire department issued 20 violations to the business. Besan Café was forced to close, police said. “I have a history of addressing illegal establishments and so I directed public safety officials to take action against Besan Cafe for various violations,” mayor Andre Sayegh said in a statement on Saturday. He closed the infamous Lava Lounge on Montclair Avenue while serving as a councilman. Sayegh replaced the notorious hookah lounge with a daycare center for children. @ibbyomar:disqus HAHAHAHAHA way to let the world know you're a snitch.. This the type of dude that you smack him 1 time to talk and have to smack him like 20 to shut up.. bro get a life and stop hating on the next man..